BCI believes public action to protest the government intrusion on our religious freedom is important, and we are pleased to share a few reports with you on how the Boston rallies went. These rallies took place in 160 cities across the U.S. on June 8, including on Capital Hill in Washington, DC. The rally was part of the nationwide effort to Stand Up For Religious Freedom. In March, 145 cities including Boston each held rallies. Even more cities participated this time including other local rallies in Worcester and Leominster. Janet Benestad who is our cabinet secretary for faith formation and evangelization was representing me at the event and was one of the speakers, together with Father Tad Pacholczyk and Sister Olga Yaqob. Scot Landry and George Martell also represented the Archdiocese of Boston at today’s Boston rally. Other speakers included former Ambassador to the Vatican and Mayor of Boston Raymond Flynn, Kris Mineau from the Massachusetts Family Institute, young adult Ann-Marie Warner, Herald columnist Don Feder, and Alexis Walkenstein from the Maximus Group. 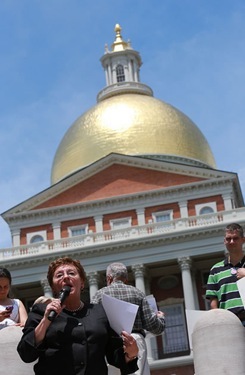 We appreciate the more than 300 attendees who took a stand today in support of religious freedom on the Common. These rallies confirm how anxious people are to begin to underscore the importance of religious freedom which is being threatened in so many different venues but particularly with this mandate that redefines Catholic institutions as those that serve exclusively Catholics or are entirely staffed and run by Catholics, in this way eliminating from that category many of our schools, hospitals and other social agencies like Catholic Charities. The U.S. Bishops recently announced the “Fortnight for Freedom” initiative which will take place from June 21 through July 4. This special period of prayer, study, catechesis and public action will emphasize both our Christian and American heritage of liberty. Dioceses and parishes across the country have scheduled special events that support a great national campaign of teaching and witness for religious liberty. One of the most significant ways we are marking the Fortnight in the Archdiocese of Boston is by holding an interactive live town hall meeting on Monday June 25 at 8pm on CatholicTV, www.CatholicTV.com, and 1060AM WQOM. We will have some short presentations regarding the issues and what is at stake and then we will take questions from the studio audience and from the viewers who can submit questions via Facebook, Twitter and Email. Please mark your calendars, join us and perhaps submit a question. This is a nice report about the rally after the fact.It is unfortunate that more was not done by the archdiocese and Mass Catholic Conference to promote the rally before the event, since this issue should be of great importance for every one of the 300,000+ Mass-going Catholics in the Boston Archdiocese, and we would urge the archdiocese to use its PR and communications engine a bit more actively leading up to these kinds of events. In addition to the Boston rally, there was also one in West Roxbury. Lou reports here that the evening rally in West Roxbury drew nearly 150 people. 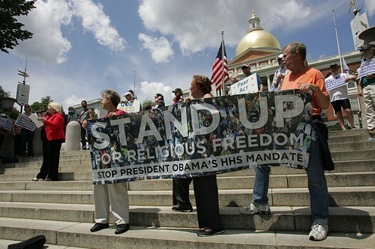 “It is important that the message be sent to congress and to the president that this is not an isolated case of a few people protesting, but that all Catholics all across the country recognize that this is a grave threat to the fundamental freedom of religious liberty,” she said. “The mainstream media has tried to imply that the bishops do not have broad support, that this is a war against women, and that women are not supporting the Church and her position on this. So, it is very important for local Catholics to demonstrate that they do stand with the Church,” Franks said. BCI suggests all readers take part in the town hall meeting and take advantage of this time to submit your questions to Cardinal O’Malley. Ironically, the town hall meeting with Cardinal O’Malley is on the same day when President Obama is in Boston for a series of campaign fundraisers, including one for $40,000/person at the home of Catholic Schools fundraiser and Finance Council member, Jack Connors Jr. (not exactly the presenting of a “unified voice” among Catholics, but that is a topic for another post). This entry was posted on Saturday, June 9th, 2012 at 3:09 pm and is filed under Religious Freedom. You can follow any responses to this entry through the RSS 2.0 feed. Both comments and pings are currently closed. 40K per plate and how much for each Jolly Green Giant green pea? Jack Connors should be disciplined instead of being a policy maker for the Archdiocese. …please pass the fried gold-plated fetuses. Mr. Connors offers a $40K /plate dinner for Obama, a man who publicly and unequivocally supports partial-birth abortion (infanticide) and apparently is OK with gender selection abortions as well. Are gold-plated fetuses such a reach? A Falsely Accused Priest By David F. Pierre Jr.
healing and complete understanding to continue. who have done no wrong must be maintained. Isn’t “presumption of innocence” a prerequisite for freedom?